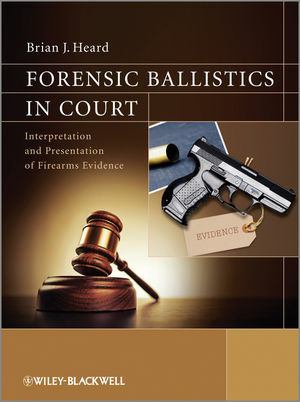 Forensic Ballistics in Court: Interpretation and Presentation of Firearms Evidence is an accessible introduction to firearms and ballistics evidence and how this is analysed and presented as evidence in a court of law. The book approaches the subject in terms of the realities of case work, opening with a clear and illustrated explanation of the correct nomenclature for various weapon types and their parts. Ammunition is also extensively covered, again with annotated illustrations. Basic external and terminal ballistics, wounding capabilities are likewise covered to give an overview of the subject. A key aspect of the book covers the theory and philosophy behind striation matches and the associated statistics, how positive matches should be peer reviewed and the importance accreditation has on this subject. Gunshot residue formation and identification and the various methods used in its analysis are reviewed in depth. This includes a critical examination of the pros and cons of each type of examination and the evidential weight which can be applied to each method. Accessible and reader-friendly introduction to firearms and ballistics. Clarifies the limitations of firearms evidence. Extensive use of global case-studies throughout. Focus on the interpretation and assessment of the weight of firearms/ballistics evidence presented at court. Covers the importance of witness and accused statements and their interpretation in relation to the investigation under review. Includes coverage of gunshot residue collection, examination and interpretation and the potential for contamination of GSR samples. Includes numerous real life case studies that the author has dealt with over the past 45 years. Takes an applied approach to the subject. Brian J. Heard, Formerly of the Ballistics and Firearms Identification Bureau for the Royal Hong Kong Police.